What’s blue, round, sweet, grows on a bush and can boost your brainpower? If you answered blueberries you would be correct. Or that should be: ‘mostly correct’. The ‘brain-boosting power’ part needs a bit more science to catch up to the headlines, but it is looking promising that blueberries may be one food worthy of a ‘superfood’ title. There is so much to be gained by having plenty of plant-based foods in your diet. While it may be tempting to stake your claim that health is all about the superfood du jour, it the variety of foods you eat that are key to good health. Blueberries are one food that pop up regularly on ‘superfood’ lists. Long promoted for their brain-boosting power, is there much merit to the claims and should blueberries be a regular part of your diet? The link between blueberries and the brain has grown out of observations that people who eat lots of fruits and vegetables over their lifetime have a lower risk of dementia. Scientists have singled in on one particular class of chemicals found in plant foods, called flavonoids, that may be the ‘active ingredient’ that could be protecting the brain from damage. A collection of flavonoids called anthocyanidins have been getting even closer attention because of their antioxidant and anti-inflammatory properties. Anthocyanidins are abundant in berries and give these foods their bright blue, red and purple colours. So how could the anthocyanidins in berries be of benefit for the brain? The high amounts of antioxidants in blueberries may be one way they help protect brain cells from damage. Berries also change the way that neurons in the brain communicate in pathways involved in inflammation and cell survival. Yet more research has shown that berries can also improve cognition, motor control and enhance neuroplasticity. 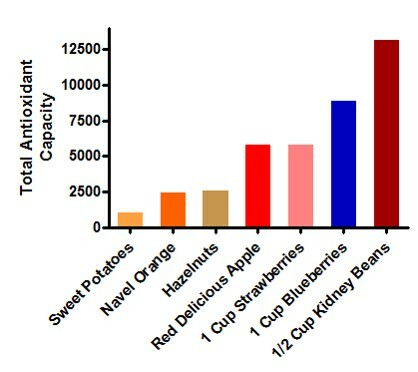 The antioxidant content of blueberries features front and centre to help explain their health benefits. 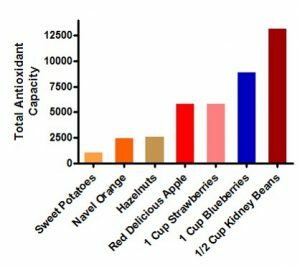 While there is more to food than antioxidants, blueberries are certainly packed full of them as this graph below shows where the antioxidant content of a range of foods was measured and compared. Top marks for noticing that in the antioxidant superfood arms race, it is red kidney beans that you want more of in your belly. Perhaps with a blueberry dessert chaser. An ageing population means a greater number of diseases linked to older age such as dementia. There is no certain way to prevent dementia, but scientists have been looking closer at the role that diet can play in reducing the risk of developing it and blueberries have attracted their interest. One recent clinical trial that attracted a lot of media attention used a concentrated form of blueberry juice – high in anthocyanidins. The trial involved 26 healthy adults aged between 65 and 77. Half of the people drank concentrated blueberry juice each day for 12 weeks. The blueberry concentrate was equal to eating 230 grams of whole blueberries each day. The other half of the volunteers drank a placebo drink that had a blackcurrant taste, but no anthocyanidins in it. After 12 weeks, people drinking the blueberry juice showed improvements in cognitive function, blood flow to the brain and activation of brain areas linked with cognitive function. There was also evidence suggesting an improvement in working memory too. Blueberries may also have benefits for the brain by keeping it active during a mid-afternoon slump. In one study, volunteers who drank a blueberry smoothie in the morning did much better at mental tasks in the mid-afternoon than people who had a placebo drink. Again, it is likely the antioxidants in blueberries that stimulate the flow of blood and oxygen to the brain to help keep the mind fresh. Eating berries regularly is also linked to improved heart health. Berries can have a range of cardiovascular benefits from their anti-inflammatory, antihypertensive, hypoglycaemic and anticoagulant actions. From a review of 22 randomised-controlled trials involving over 1200 people, regularly eating berries could significantly lower LDL-cholesterol, blood pressure, fasting glucose, body mass index (BMI) and glycosylated haemoglobin A1c (HbA1c). The cell signalling molecule involved in inflammation (tumour necrosis factor-α) also drops when people switch to eating more berries. Fresh is great, but for convenience (and price) and when they are out of season, you can’t go past having frozen blueberries on hand. And as a bonus for choosing frozen, because they are processed and frozen soon after picking, the nutrient losses are small. In fact, a study from the Journal of Biomedicine and Biotechnology found that drying and freezing blueberries has no impact on the antioxidant activity of anthocyanin extracts. Here are some top tips to get more blueberries in your diet. For a big blueberry hit, a smoothie is the way to go. Try 1/2 cup Greek yoghurt, 1/2 cup water, 1 cup of frozen berries, 1 banana and 1 teaspoon honey in a blender. An ageing population means a greater number of diseases linked to older age such as dementia. There is no certain way to prevent dementia, but scientists are looking closely at the role that diet can play in reducing the risk of developing it. Choosing a diet high in a variety of fruits and vegetables and including some delicious berries may go some way to reducing the risk of declining brain function in older age. And when it comes to blueberries, this is a case where the superfood hype may actually have a bit of solid science to support it. 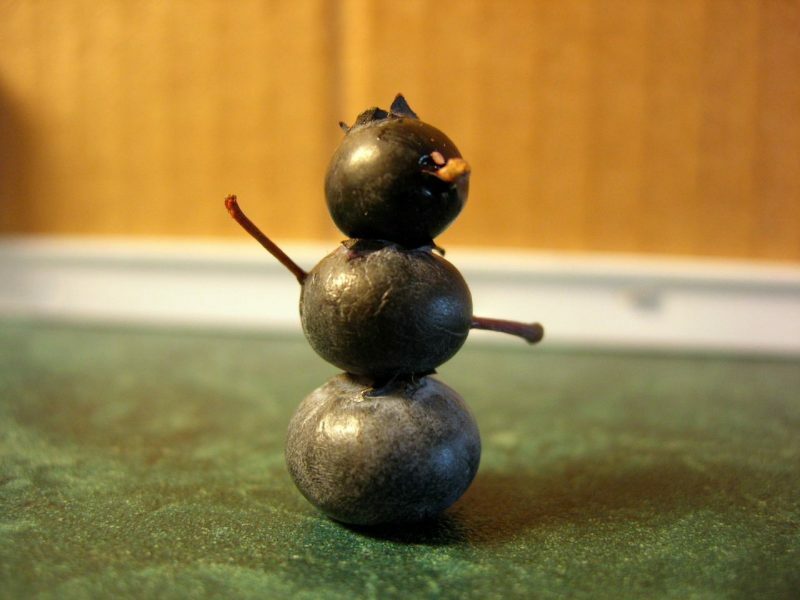 Good research into why blueberries are a superfood! I love learning about brain health, thanks for the insight! Thank you, Tim, for another wonderful article. I read a lot about the nutritional benefits of blueberries but as always your information is based on evidence and scientific research. Too much to learn and enjoy!